The Spirit IN200 treadmill is definitely overpriced. For a treadmill with a price tag of more than $1,000, this machine has nothing special on it. Its features and specs are just basic. The only thing positive I see with it is its long motor warranty. If price is the only factor you’re looking for in a treadmill, then is a choice. It is one of the cheaper treadmills from Spirit. However, I highly recommend you read this review first before making any decisions. The Spirit IN200 offers a 2.0HP motor which reaches speeds of up to 10 mph and is inclinable for up to 10%. These features allow you to modify the intensity of your workouts to suit your fitness level. 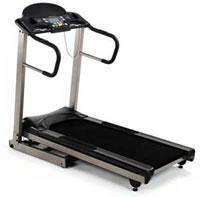 The 51"L x 18"W tread belt is a little short compared to other Spirit treadmills, especially those from the Z series. Well at least with a small tread belt, the motor won’t have as much of a hard time operating compared to machines with oversized belts. As with most treadmills, this unit is also equipped with pulse grip to monitor your heart rate and enable you to workout in your target heart rate zone for a more efficient exercise. The main weakness of the Spirit IN200 is its lack of quality. Also, I think it is a bit overpriced since its features are standard to most treadmills, even the cheap ones. I do not recommend this treadmill. I honestly believe that there are a lot more treadmills out there that would give you more value for your money. If you really want a treadmill in the $1,000 or less price range, please read our Smooth 5.15P review. It is currently our best buy entry level treadmill. Belt Size: 18" x 51"
If even after reading this review you still plan on buying a Spirit IN100 treadmill, I suggest you buy it from Amazon.com. You can get it for just $1,099.99.